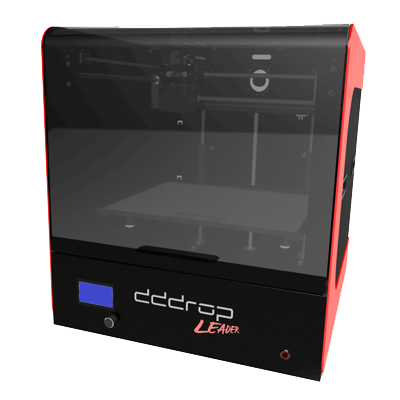 dddrop 3D printer serie - Support for the dddrop 3D printer? FLEX FLEX Use lighter filament-clamp spring! TPU TPU Use lighter filament-clamp spring! * Always update your slicing software to the latest version. Settings are only a guideline. When you use Simplify3D: Import the .fff file(s) to Simplify3D. When you use Slic3r: Import the .ini file(s) to Slic3r. Settings for dual extruder prints with the same or different materials: These materials can be the same or different. Firmware updater: To put the latest firmware on your 3D printer. Download the dddrop firmware updater .zip. Unzip de file on your PC. First download the latest firmware file (.hex: See downloads below) and then install it on your 3D printer. First make sure you have the dddrop firmware updater installed on your PC. Download and unzip this file to your PC (remember your location). After starting the dddrop-updater program, choose the firmware file (.hex). Then your pc uploads the new firmware on your dddrop Leader TWIN 3D printer. After starting the dddrop-updater program, choose the firmware file (.hex). Then your pc uploads the new firmware on your dddrop Leader 3D printer.